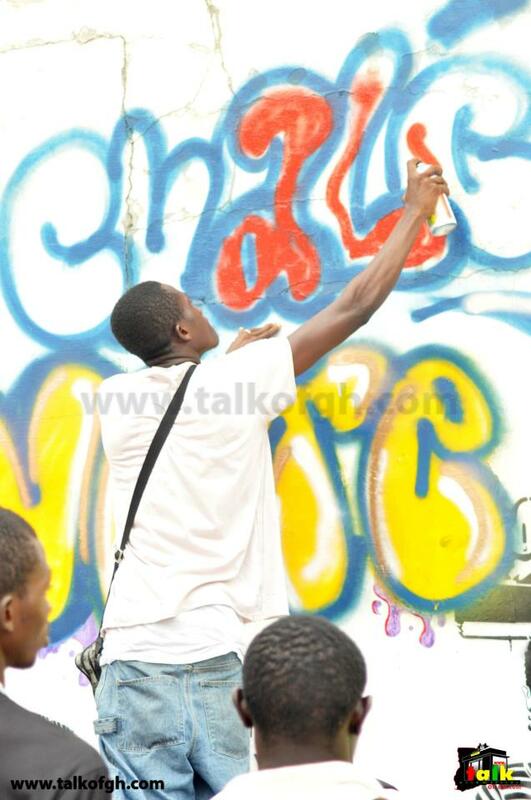 The premiere edition of the CHALE WOTE Street Art Festival, on July 16th, was a success because many people believed in a simple idea. Teamwork and artistic talent make a powerful combination. 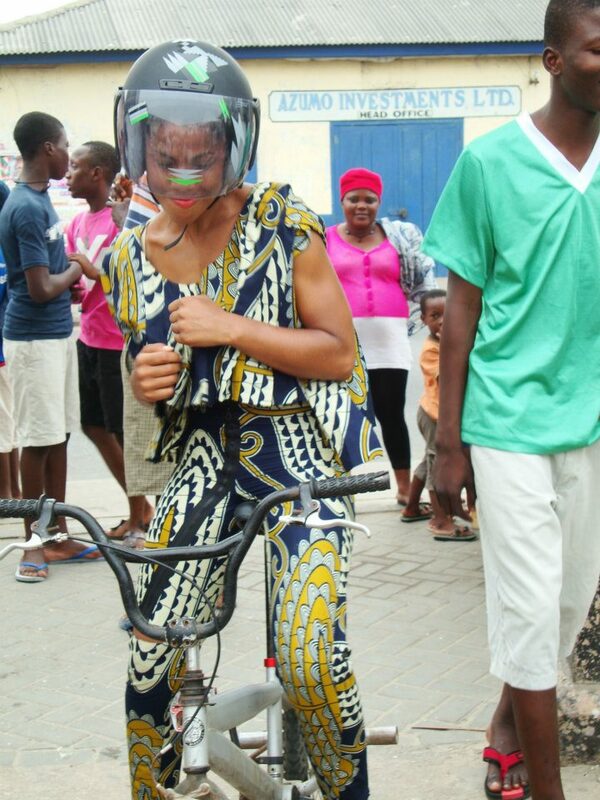 With only three months to plan and a limited budget, more than a dozen young creative professionals rolled up their sleeves and got to work on the largest free street festival to ever hit Accra. The result: a 12-hour fantastic street maze of live action art stretching from the Mantse Agbonaa to the old Kings Way building—graffiti + street painting, bike/skateboard/rollerblade street stuntin’ parties, art installations, experimental theater, a fashion circus, drumfunkbass music, spoken word, and a live music concert—never before seen on this scale in James Town. The idea began at a Talk Party in Osu back in March. The monthly discussion series is hosted by ACCRA [dot] ALT. “We were tired of talking about change. It was time to take action and generate a viable economy for art in this city. CHALE WOTE is well on its way to making Accra a cultural hotbed and international destination,” says filmmaker and ACCRA [dot] ALT producer, Mantse Aryeequaye. The idea was to link artists across the city to the James Town community by providing new networks of information, access, and exchange for a range of creative projects. Why James Town? This old Accra neighborhood possesses unique architecture, a die-hard people’s spirit, a remarkable fishing culture, brilliant boxers and fascinating connections to Brazil that are an inspiration to scholars and artists near and far. ACCRA [dot] ALT partnered with The French Embassy/Institut Francais, the Ga Mashie Development Agency, JustGhana, the Foundation for Contemporary Art Ghana (FCA), Pidgen Music, Attukwei Art Foundation, The WEB (Young Designers Hub), Ehalakasa Poetry Slam, and DUST Magazine to produce the one-day festival. 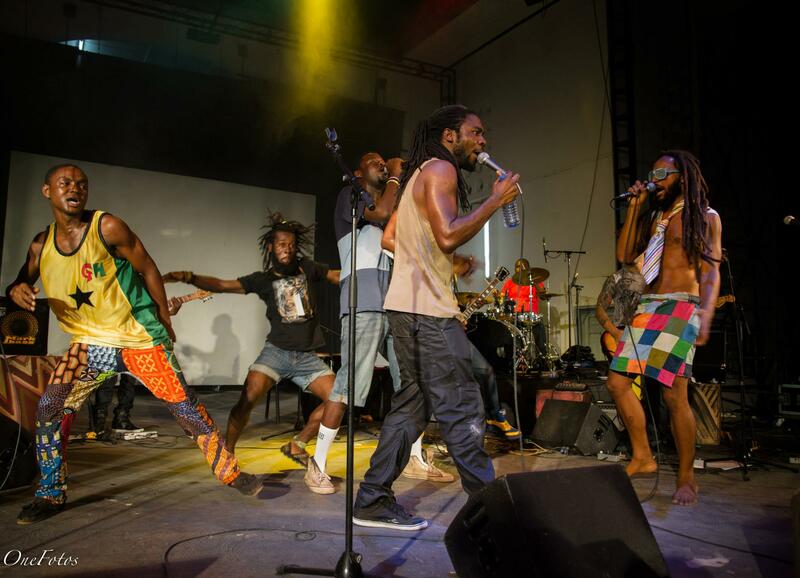 More than 100 artists and 100 students from community schools in James Town participated and the idea of CHALE WOTE broke new ground as reality. “CHALE WOTE is an expression that everyone in Ghana is familiar with. They are worn on the feet but also mean, ‘man, let’s go!’ So it’s a term to mobilize different kinds of people towards an appreciation for public and spectacular art,” states Dr. Sionne Neely, a producer with ACCRA [dot] ALT. An eclectic audience of more than 2000 people attended the festival, many showing their solidarity by donning chale wotes. Massive soundsystems were rigged up on a few key streets and heavier sounds of drumbassfunk and indie mashups took over from where dreary city tunes left off. Chale Wote was pervaded by a carnivalesque spirit that kept people pouring into the streets. It also served a social purpose in attracting residents from other parts of Accra to a historically marginalised area, creating an inimitable spirit of fun transcending social and cultural boundaries. There was something for everyone to enjoy, including the incredible graffiti murals by FCA; the Funky Fishnet fashion exhibit by The WEB featuring psychadelic human mannequins; the Afro-Futuristic digital human theater by Jamestown’s own drama troupe, Act for Change; Ga + pidgin poetry by Ehalakasa Poetry Slam; live stunt street parties by the Flat Land Boys Biker Crew, Rolla Wondaland and the PushaMan Skateboarders; and interactive installations by performance artists, I.U.B., Bernard Akoi-Jackson and Just-Ghana’s James Town Artist in Residence 2011, Serge Attukwei Clottey. The festival also had children art workshops—tire racing, kite-making, T-shirt design, and trash to treasure recycling—as well as capoeira performance, live brass pop grooves, and a food and craft bazaar. The old Kings Way Building was the focus of the festival with an exquisite transformation from a barren, crumbling façade into a stunning portrait and tribute to the history and peoples of James Town. This space buzzed alive with a myriad of activities for children, adults, local residents and tourists, all coming together to create art. Around 7:30pm, the building transformed again from a public art gallery to a concert hall. Hundreds of children crowded towards the front of the stage laughing and dancing excitedly to the band’s music while the adults sipped drinks and chatted along the fringes. The live music of Yaa Pono, J-Town, Mutombo, E.L., Ecxtreme, Scizo, Lady J, Bukom Dancehall, Powers, Delasi Nunana, Abena, and Oga Chuxx, among others, energized the crowd. So much so that when the concert ended a little after 10pm, many folks stayed on hoping for more action. If you missed out on all the fun, don’t fret. 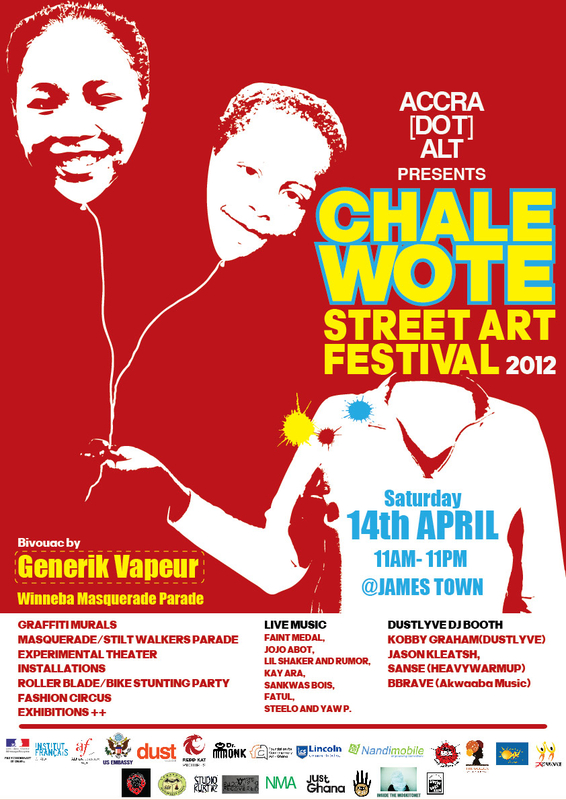 The CHALE WOTE Street Art Festival will return to James Town April 2012. For more information, check out ACCRA [dot] ALT on FaceBook: www.facebook.com/ACCRAdotAlt and Twitter: @Accradotalt.